Baz goes on a journey with Super Mario Odyssey, and returns a changed man. You know that goofy look your friend gets when they are texting someone they have a crush on? I think I wore that some love-struck look for the entire 20 hours I spent completing the main story of Super Mario Odyssey. When I first saw the game, I thought… that is beautiful. Then I began to play around with it, and it just felt so right, you know? So, my feelings began to grow. And now that I know it intimately, I am head over heels in love and plan to marry it in a ceremony almost as bizarre as the one between Bowser and Peach. But first I need to get permission from its parent. So, Nintendo… can I please? Because, gosh darn it, you have just created something so wonderful I need to make an honest cartridge out of it. 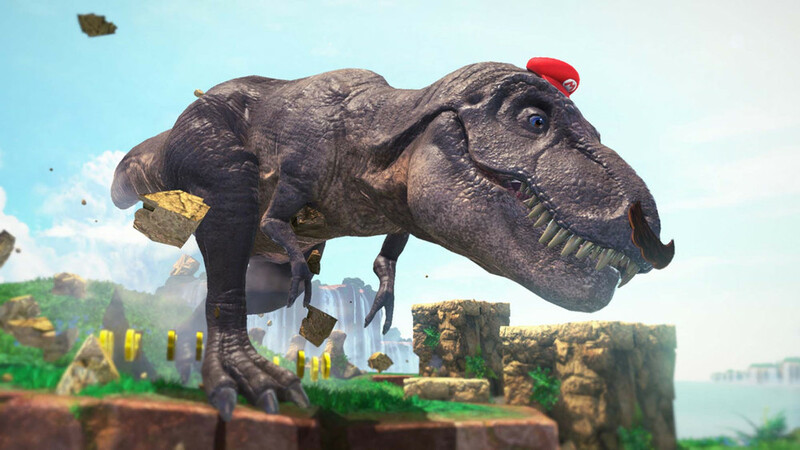 In all seriousness, Nintendo has truly outdone itself with this latest addition to the 3D Mario series. It is games like these that make you realise how 'inside the box' much of what we play is. Sure, all games have surprises here and there, but when you play something as truly innovative as Super Mario Odyssey you realise how safe most other titles are playing it. Nintendo is not playing it safe with this game. It seems like no mechanic, character or location was left on the cutting room floor, and it is the resulting variety of experience that makes Mario’s latest adventure the masterpiece it is. Nintendo has taken the familiar and beloved foundations of Super Mario 64 and built something new and repeatedly surprising on top of it. Mario feels very familiar in the way he triples jumps, back flips and ground pounds, but the places and ways in which he uses these mechanics is something entirely new. One moment you will be leap-frogging across a lava filled room à la the Bowser levels in Mario 64, and the next riding an unruly golden tiger across a desert or racing RC cars around a track in the middle of a city. There is never a moment where you feel like you have seen every mechanic the game has to offer, because around every corner there is something new to play with, explore, or traverse. 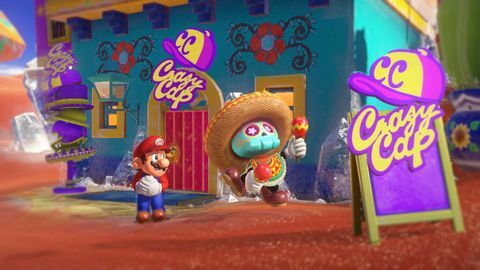 Integral to this diversity is Mario’s new pal Cappy, a hat companion who allows Mario to take control over more than 50 different enemies, allies, and objects around the kingdoms. Controlling any one of these avatars is a game changer, literally. Every single one drastically changes your approach to gameplay and offers new opportunities for exploring the world and solving puzzles. A good example is the onion enemy you meet early on in the wooded kingdom. When controlled, the onion allows you to grow tall and jump up onto high ledges. This opens up whole new areas for exploration and gives you a new way of thinking about obstacles on that level. Nintendo built the kingdoms around the controllable creatures in each area, and so it often feels like a Metroidvania in how you begin to associate the puzzles with the character you will need to unlock it. Nintendo went further than to just use these avatars as tools, but also found neat ways to challenge you into becoming skilled and creative with these different mechanic sets. These challenges sometimes take the forms of tricky puzzles which require you to use a mechanic in complex ways, while other times they are skill challenges in which – for example – you need to quickly traverse a platforming section with the onion as lava rises beneath you. Driving this exploration is your hunt for moons in every kingdom. 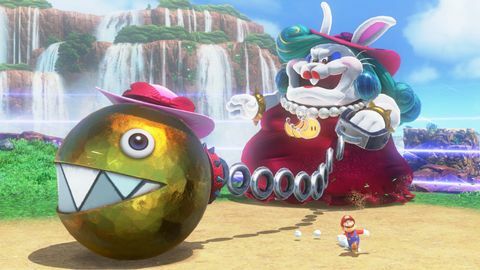 These moons power your ship, The Odyssey, which you and Cappy use to hunt down Bowser before he can marry Princess Peach. 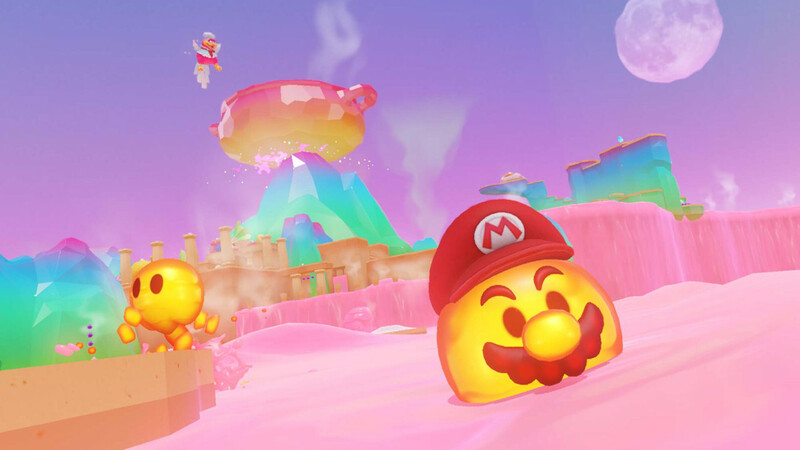 Unlike Super Mario 64 where each stage contained eight stars, the moons in Odyssey are abundant, scattered all around each kingdom and rewarded for numerous accomplishments, from defeating a boss, to simply ground pounding the right spot. There are almost 900 moons in the game, which means finding them all will require more than just one play through. I finished the campaign with a little under half of them despite hunting each area meticulously throughout my adventure. In fact, it isn’t actually possible to finish the game with all the moons, as some only become accessible when you finish the campaign. New kingdoms also open up at that point and continue to as you unlock more moons. This gives the game a sense of purpose long after you have saved Princess Peach. Continuing to hunt doesn’t feel like simple completionism, but rather, the post-game content seems as much a part of the adventure as the main story does. What the post-content doesn’t bring over, however, is the sheer spectacle of many moments of Odyssey’s story. There were multiple instances in the campaign where I sat mouth agape, staring disbelieving at where Nintendo has taken this latest romp. I won’t spoil the specifics of these set pieces, but the developer has really taken the leash off of its most beloved series and introduced elements that seem foreign yet somehow make the world all the more wonderful. A non-spoiler example is the people in New Donk City. This metropolis is filled with normally proportioned humans, introducing people to the Mario universe. This juxtaposition of style may seem jarring at first, but when taken with the rest of the style clashes in the game, it gives the entire universe a sense of possibility and wonder that shines through every moment. This wonder is a large part of what makes exploration such a pleasure in Odyssey. It’s not just that Nintendo gives you a reason to explore, but that it gives you somewhere you want to explore. Every single kingdom brings its own unique spin on exploration, with some tall and treacherous, and others flat and expansive. Regardless of the shape a kingdom takes, it is full to bursting with things to find, puzzles to solve and wonders to behold. Super Mario Odyssey may not have created a genre the way Super Mario 64 did, but it has redefined not only that genre, but games in general. Nintendo has shown how restricted games can be, and used its own marquee title to prove those limitations need not exist – that anything is possible. 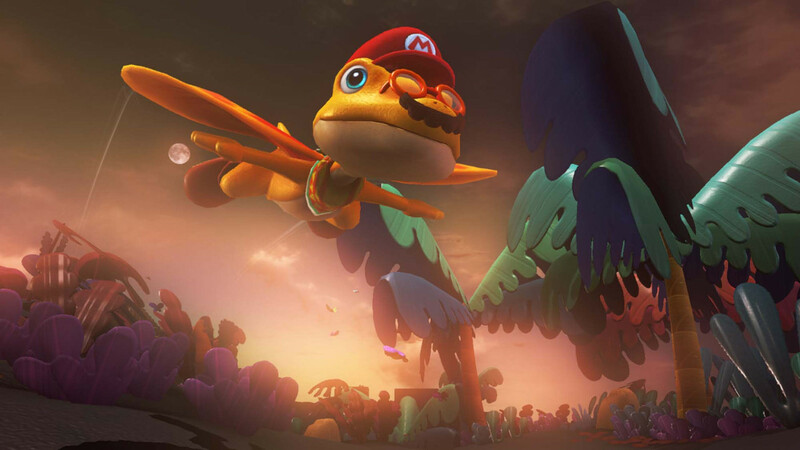 Odyssey is a fever dream amalgamation of ideas, polished it into a flawlessly designed and executed experience. Ups Wide-eyed exploration. Plenty of gameplay variety. Cappy mechanics. Post-game content.